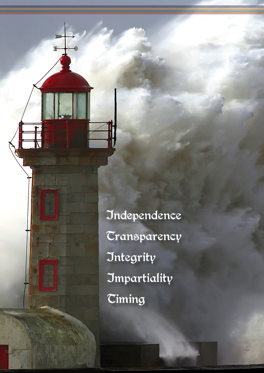 Independence, Transparency, Integrity, Impartiality and Timing. The independent International Governance and Ethics Committee — IGEC — is responsible for giving advice and guidance to iPRI in the selection of studies to be conducted by iPRI and to bring its global expertise to assist with difficult or controversial issues within applications presented. The International Governance and Ethics Committee — IGEC — has a major responsibility to expedite the appropriate ethical review of all research proposals involving iPRI. All studies iPRI is performing are based on scientific excellence and undergo strict ethical review. The ethical review is performed by IGEC. All scientific findings are sent for publication in peer-reviewed journals. Specific provisions are made for avoiding any role of public and private sponsors in reporting of scientific findings. (1) The World Medical Association (WMA) has developed the Declaration of Helsinki as a statement of ethical principles for medical research involving human subjects, including research on identifiable human material and data. (6) The primary purpose of medical research involving human subjects is to understand the causes, development and effects of diseases and improve preventive, diagnostic and therapeutic interventions (methods, procedures and treatments). Even the best proven interventions must be evaluated continually through research for their safety, effectiveness, efficiency, accessibility and quality. (16) Medical research involving human subjects may only be conducted if the importance of the objective outweighs the risks and burdens to the research subjects. (21) Medical research involving human subjects must conform to generally accepted scientific principles, be based on a thorough knowledge of the scientific literature, other relevant sources of information, and adequate laboratory and, as appropriate, animal experimentation. (24) Every precaution must be taken to protect the privacy of research subjects and the confidentiality of their personal information. (26) In medical research involving human subjects capable of giving informed consent, each potential subject must be adequately informed of the aims, methods, sources of funding, any possible conflicts of interest, institutional affiliations of the researcher, the anticipated benefits and potential risks of the study and the discomfort it may entail, post-study provisions and any other relevant aspects of the study. (27) Researchers, authors, sponsors, editors and publishers all have ethical obligations with regard to the publication and dissemination of the results of research. Researchers have a duty to make publicly available the results of their research on human subjects and are accountable for the completeness and accuracy of their reports. All parties should adhere to accepted guidelines for ethical reporting. Negative and inconclusive as well as positive results must be published or otherwise made publicly available.